Rock legend David Bowie has led the tributes to US singer and former Velvet Underground frontman Lou Reed, who died on Sunday aged 71. Bowie's Facebook page said of his "old friend", considered one of the most influential singers and songwriters in rock: "He was a master." Reed's literary agent said he died of a "liver-related ailment". The last tweet posted on his official Twitter account, hours before the news of his death, simply stated: "The Door". The tweet links through to a photograph of a door, with a poster of Reed on it and the words "Papa Loves Baby" scrawled underneath. Reed's former Velvet Underground bandmate John Cale wrote on his website: "The world has lost a fine songwriter and poet… I've lost my 'school-yard buddy.'" 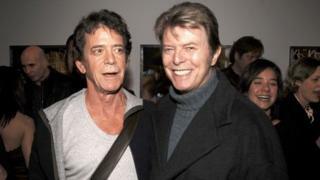 Other stars paying tribute included The Who, who tweeted: "RIP Lou Reed. Walk on the peaceful side." Iggy Pop said it was "devastating news". "I am a triumph of modern medicine," Reed posted on his website on 1 June. But Reed's literary agent Andrew Wylie said the musician, who died at his home in Long Island, New York, on Sunday morning, had not been well "for a few months". British music journalist Charles Shaar Murray told BBC Radio 4's Today programme that Reed "completely changed the cultural landscape we inhabit". He said that although Velvet Underground were "spectacularly unsuccessful", The Beatles and Bowie were "huge fans" of Reed, and that he "exercised huge influence on glam rock and punk and everything that grew out of those phenomena". Mr Murray added that Reed "did not suffer fools... or journalists gladly", adding that "he was not considered a likeable man, except by his closest friends". He used the "deliberate withholding of charm as a weapon" and "performed to a smallish but loyal audience sufficient in number to sustain a comfortable lifestyle". Many musicians paid homage to the influence Reed had on their own careers. Nikki Sixx of heavy metal band Motley Crue tweeted: "RIP Lou Reed. Thank you for your beautiful/dark lyrics/music and stance on life. You inspired me from my teenage years right up till today." US singer Cyndi Lauper added that she was grateful for "his music and the influence he had on my music". Tom Morello, of Rage Against the Machine and Audioslave, said: "My intro to Lou Reed/Velvet Underground was Jane's Addiction cover of 'Rock n Roll'. He was a singular, unique talent. RIP Lou and thanks." Reed's individuality was also hailed by Paul Stanley of Kiss, who called him "a musician, artist and trailblazer who played by his own rules". However, the band never achieved commercial success during their 1960s existence, but their influence on music in later decades was widely recognised. US actress Mia Farrow, whose career also began in the 1960s, simply said: "Deepest Gratitude Lou Reed. Peace. " British author Salman Rushdie expressed his loss by tweeting: "My friend Lou Reed came to the end of his song. So very sad. But hey, Lou, you'll always take a walk on the wild side. Always a perfect day." US actress Whoopi Goldberg, paid tribute, saying: "The great & amazing Lou Reed has died my condolences 2 his wife Laurie Anderson. Lou was 1 of a kind & this colored girl still says dededede...". US actor Samuel L Jackson added: "R.I.P. Lou Reed. Just met at the GQ Awards. The music of my generation. Still Relevant!" British comic and actor Ricky Gervais described Reed as was "one of the greatest artists of our time", while presenter and broadcaster Jonathan Ross said of the musician: "A great talent, a nice man, a sad day." Ian Broudie from the Lightning Seeds, who sang on the single, told the BBC Reed was able to convey life in New York. "His lyrics are poetry, really. And he seemed to deal with things that no other writer seemed to really deal with in songs. The Velvet Underground would probably be dealing with drugs, sexuality, everything." As a solo artist, he released 20 studio albums. His last, Hudson River Wind Meditations, was released in 2007. Reed is survived by his second wife, the musician and performing artist Laurie Anderson. What are your memories of Lou Reed? Did you ever meet or work with him? Send us your thoughts and pictures?